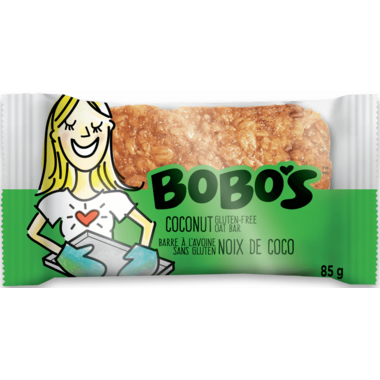 Bobo's Coconut Bar combines their hearty oats with sweet organic coconut flakes, transporting every eater to a tropical paradise. While they recommend consuming this bar on an island, it may also be enjoyed at every other moment in life. Ingredients: Organic rolled oats, brown rice syrup, buttery spread [oil blend (palm fruit, canola, olive oil), water, salt, natural flavor, sunflower lecithin, lactic acid, annatto (color)], organic cane sugar, organic coconut, natural coconut flavor, xanthan gum. Contains: coconut. May contain traces of pecans, almond, peanuts. I think this is delicious. Not too sweet but good coconut flavour.